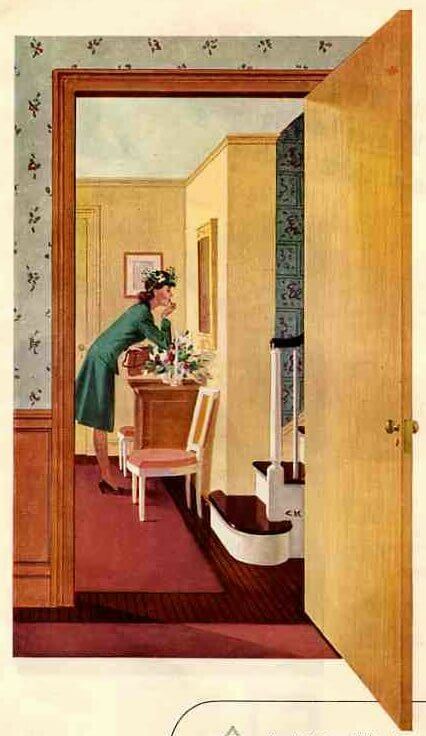 This 1945 advertisement spotlights a very under-appreciated design feature — the interior, flat panel birch plywood door. 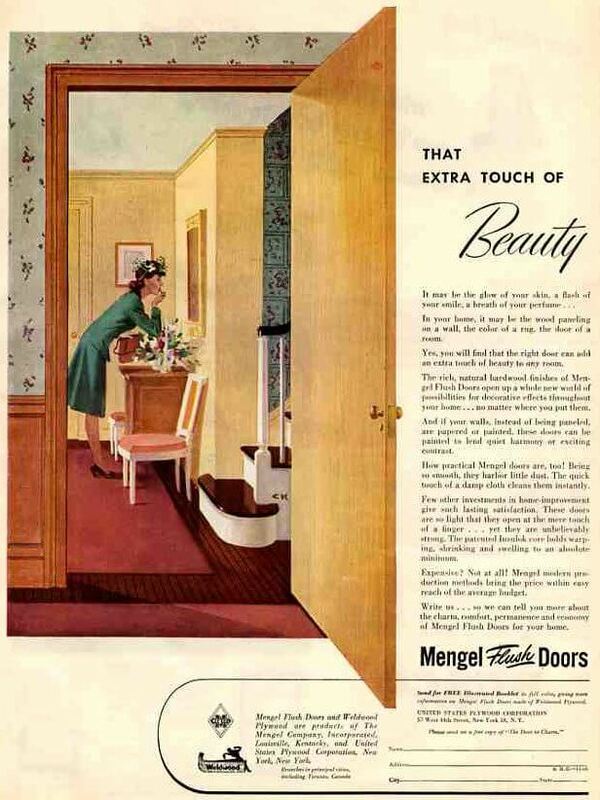 The ad points out that these doors are easy to stain to match your paneling… or they can be easily painted “to lend quiet harmony or exciting contrast.” They are dust-free — just wipe with a damp cloth! They open and close so easily. And inexpensive, and durable. These doors are still widely available today, we replaced a bathroom door that had been chewed up with one from the Brosco catalog, which I believe is widely available at lumber stores. I have these doors throughout the “modern” bedroom and basement sections of my house (colonial panel doors in public areas including kitchen). And you know what? This little piece of marketing history made me actually notice and embrace them. A great piece of illustration, don’t you think. I love the snippets of wallpaper shown in the foyer and stairway… and of course, the Mrs.
Our house sounds like yours — colonial panel on the front and back doors, then these birch doors on the bedrooms and baths. Again, I am glad you pointed out how this mix of colonial and modern was the thing. I haven’t liked these birch doors much, but knowing it was the thing to have both door styles on a house makes them a bit more meaningful! We have those birch doors, but some are covered wth tape, dirt, scratches, and the varnish is coming off. Any suggestions on restoring them?